A Wheaton man was arrested after trying to distribute pills to a minor last week. 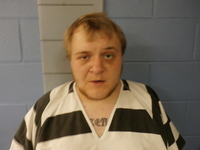 According to the affidavit of probable cause, Samuel Allen Mahurin, 23, of Wheaton, had possession of a controlled substance and an unmarked prescription pill bottle on June 14. Allegedly, Mahurin distributed the pills to two different individuals and also tried to give some to a sixteen year old minor, who refused. Mahurin is in jail on one count of distribution of a controlled substance, one count of possession of a controlled substance, and one count of endangering the welfare of a child in the first degree. His bond is set at $25,000, cash-only.